MIP payments insure the repayment of a mortgage loan. 2. Can I Refinance to Drop FHA Mortgage Insurance? Mortgage insurance premium is insurance on repayment of the loan; a guarantee that if the borrower defaults, a lender who forecloses on the house will not suffer a loss on the loan. The acronym MIP is specific to insurance on loans guaranteed by the Federal Housing Authority. 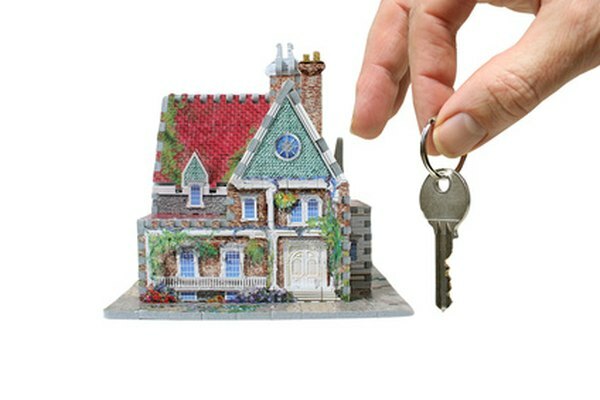 Mortgage insurance on other loans goes by the term PMI for private mortgage insurance. The FHA enforces several rules regarding the payment of MIP by the homeowner. Mortgages carry considerable risk. Borrowers may fall behind on their monthly payments, or default altogether and allow the lender to foreclose -- a tangled, expensive and time-consuming process. Conventional loans on houses require high down payments, usually 20 percent of the purchase price. However, with an MIP arrangement the down payment on an FHA-guaranteed loan falls to 3.5 percent depending on the buyer's qualifications. The system of mortgage insurance offers several economic benefits, including wider home ownership, more qualified buyers and a more active real estate market. As of April 2012, the FHA required an MIP upfront payment of 1.75 percent of the loan amount at closing, which can be financed as part of the mortgage loan. The monthly MIP premium, or renewal premium, is 1.2 percent of the loan amount if the loan-to-value is equal to or lesser than 95 percent. The premium rises to 1.25 percent if the loan-to-value is higher than 95 percent. The company servicing the loan and collecting payments includes the MIP in the monthly mortgage payment. The FHA offers a Streamline Refinance program that allows homeowners to change the terms of their loans. Upfront and monthly MIP payments are still required. If the original loan was closed before June 1, 2009, the upfront premium is .01 percent of the loan, or $20 on a $200,000 loan The annual premium is .55 percent of the loan amount, regardless of the term of the loan or the loan-to-value ratio. If the original loan closed after June 1, 2009, the upfront and monthly MIP on a Streamline Refinance is the same as with new FHA mortgages. If the mortgage is less than three years old, the FHA will refund a portion of the original MIP the borrower paid on the loan. The annual MIP premiums vary with the term of the loan and the loan-to-value. The annual premium on 30-year loans with loan-to-value under 95 percent is 1.20 percent; over 95 percent loan-to-value requires an annual premium of 1.25 percent. The MIP can be cancelled after a certain duration provided the homeowner has made regular mortgage payments. On 30-year FHA-guaranteed loans, this can happen after five years and when the loan-to-value ratio reaches 78 percent. On a house worth $100,000 on closing, for example, FHA mortgage insurance can be cancelled when the mortgage principal amount reaches $78,000 and five years has passed. The five-year rule is waived if the mortgage has a term of less than 15 years. The cancellation terms for private mortgage insurance vary. An industry standard rule allows cancellation when the owner holds 20 percent equity in the home, based on a new appraisal of the home value. Under these conditions, mortgage insurance can be cancelled on a house appraised for $100,000 if the owner has $80,000 left on the mortgage.